You can create a route in Movescount, or import a route created with another watch from your computer to Movescount. You can also record a route with your Suunto Ambit3 Run and upload it to Movescount (see Recording tracks). Sync your Suunto Ambit3 Run with Movescount using Suunto Movescount App (manually start sync, see Syncing with mobile app) or by using Moveslink and the supplied USB cable. Routes are also deleted through Movescount. You can navigate a route you have downloaded to your Suunto Ambit3 Run from Movescount (see Routes) or recorded from an exercise (see Recording tracks). You can also navigate as a sport mode (seeNavigating during exercise). Scroll to Navigation with Start Stop and enter with Next. Scroll to Routes with Start Stop and enter with Next. The watch displays the number of saved routes and after that a list of all your routes. Scroll to the route you want to navigate with Start Stop or Light Lock. Select with Next. Press Next and select Navigate. Alternatively, you can select View to first preview a route. The watch displays all the waypoints on the selected route. Scroll to the waypoint you want to use as the starting point with Start Stop or Light Lock. Accept with Next. If you selected a waypoint in the middle of the route, Suunto Ambit3 Run prompts you to select the direction of the navigation. Press Start Stop to select Forwards or Light Lock to select Backwards. 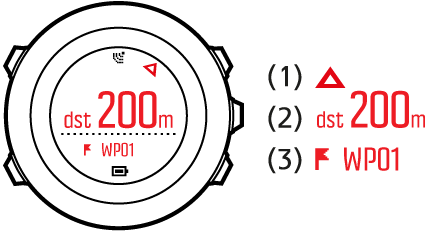 If you selected the first waypoint as the starting point, Suunto Ambit3 Run navigates the route forward (from the first to the last waypoint). 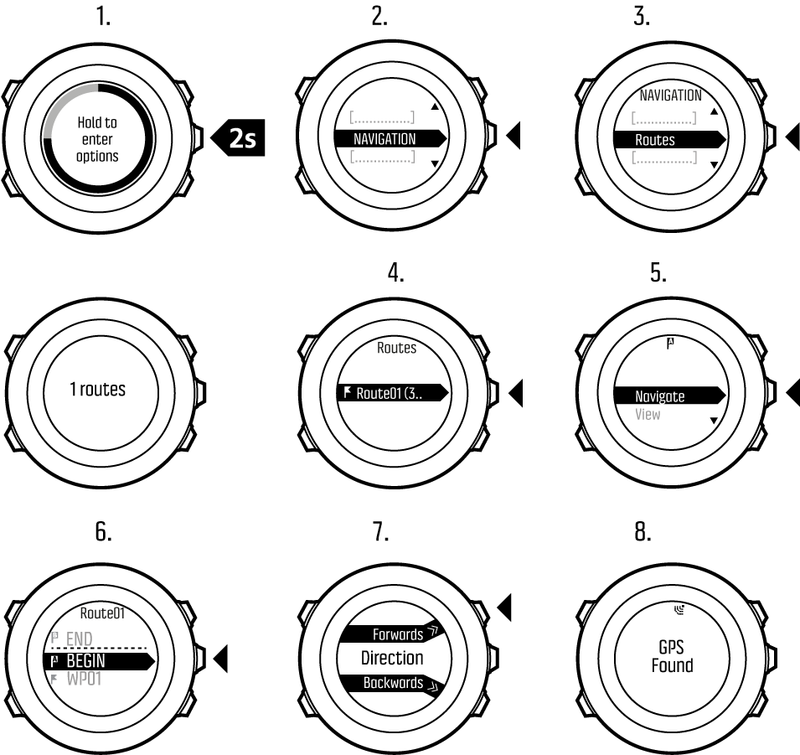 If you selected the last waypoint as the starting point, Suunto Ambit3 Run navigates the route backwards (from the last to the first waypoint). If you are using the compass for the first time, you need to calibrate it (see Calibrating compass). 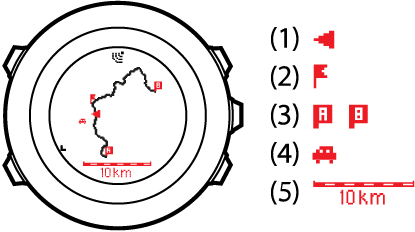 After activating the compass, the watch starts searching for a GPS signal and displays GPS found after acquiring the signal. Start navigating to the first waypoint on the route. The watch informs you when you are approaching the waypoint and automatically starts navigating to the next waypoint on the route. Before the last waypoint on the route the watch informs you that you have arrived at your destination. While you are navigating a route, keep Next pressed to access the options menu. Scroll to Skip waypoint with Start Stop and select with Next. 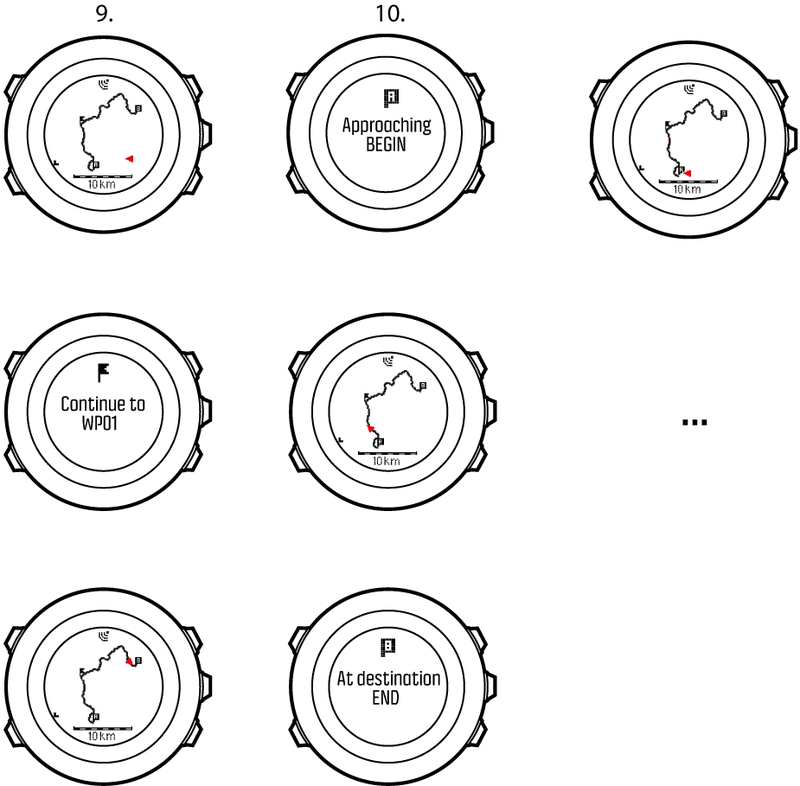 The watch skips the waypoint and starts navigating directly to the next waypoint on the route. zoomed-in view of the route. You can change the map orientation in the watch settings under GENERAL » Map. (4) The closest POI is shown as an icon. In the full track view the north is always upwards.